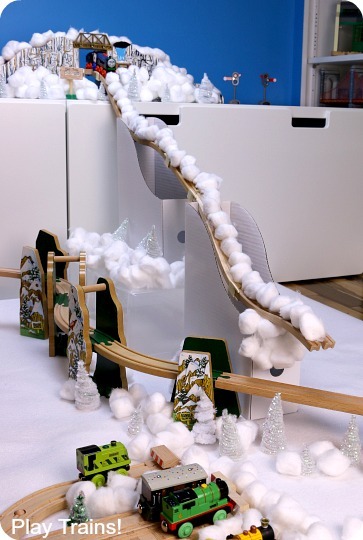 Of all the kinds of scenery we’ve come up with to decorate our wooden train layouts, my favorite is most definitely snow. 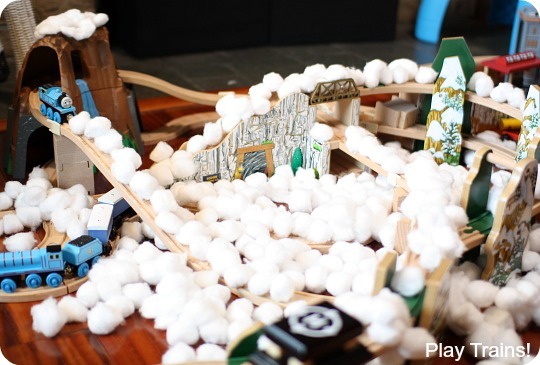 Not only is it pretty, but it’s also interactive: trains can plow through the snow on the tracks, or haul it around in freight cars. 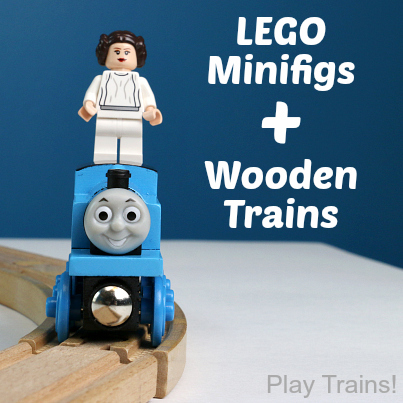 It also is perfect for inspiring new story lines during train play. 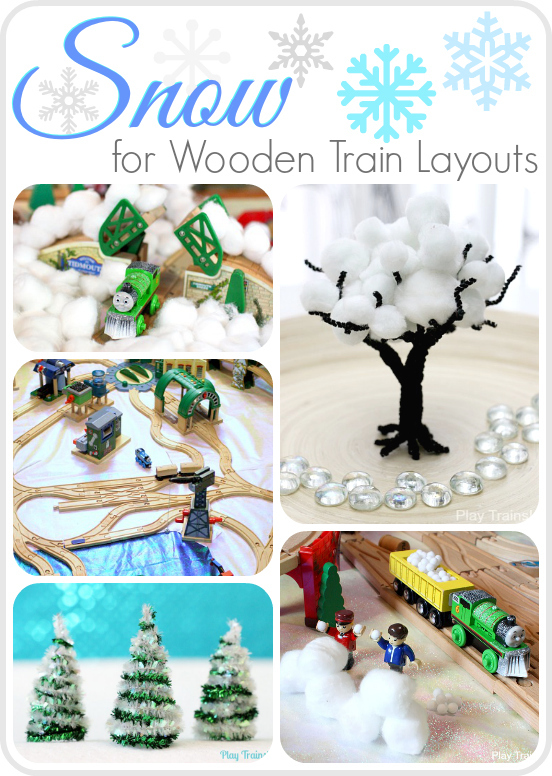 Here are several of our favorite ways to add snow to wooden train layouts. 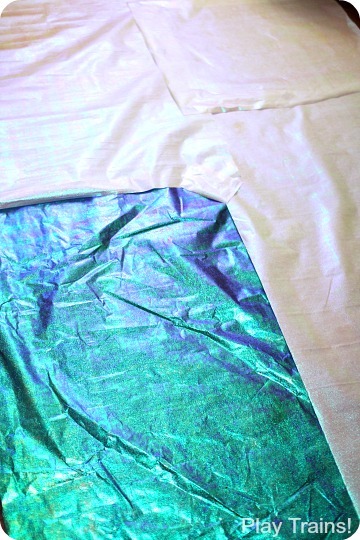 Years back, I got the prettiest iridescent wrapping paper at Ikea, in both white and a beautiful blue-green. I loved it so much I bought several rolls. The only problem was that Scotch tape wouldn’t stick to it properly, so all my presents came unwrapped. That made it useless as wrapping paper, but I kept it all these years because it’s so pretty. Guess what? I makes beautiful snow and water for train layouts. It’s so pretty in person! I’ve used this wrapping paper on the floor for our big Valentine’s Day in Vicarstown train layout and on the train table for our White Christmas train layout. 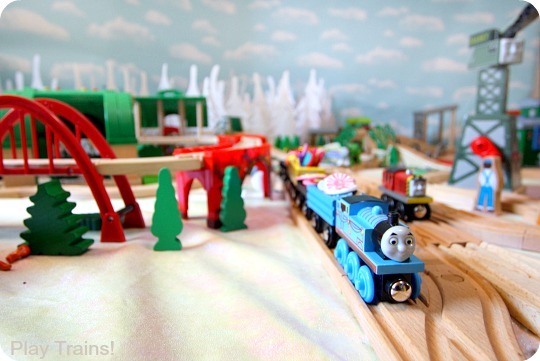 In both cases, the white paper became the snow, of course, and the blue-green paper became the sea on the big layout and a pond on the little train table. 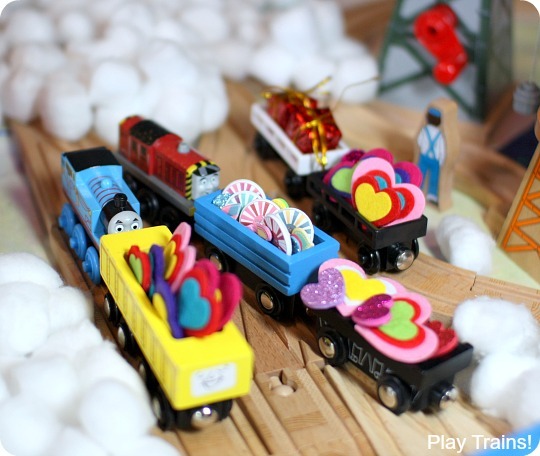 To piece it together to make the large Valentine’s Day in Vicarstown layout, I used loops of residue-free duct tape to stick it to the play rugs below (the same stuff I used in Damage-Free Decorating for Wooden Train Layouts) and loops of blue painter’s tape to stick it to the other pieces of paper where they overlapped. I have to say, though, that I would mostly recommend the paper for train tables (no tape needed), and not for the floor. It was kind of a pain to adjust the tape loops underneath as the paper shifted around while I built the tracks on top of it. 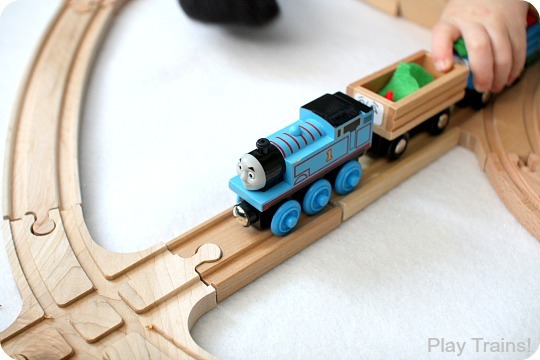 It mostly stayed in place in the weeks we left the layout like this, and it looked amazing, but it was a lot easier to deal with when I put it on the train table at Christmastime. My replacement for the wrapping paper on the floor is a large three-yard piece of sparkly white felt. 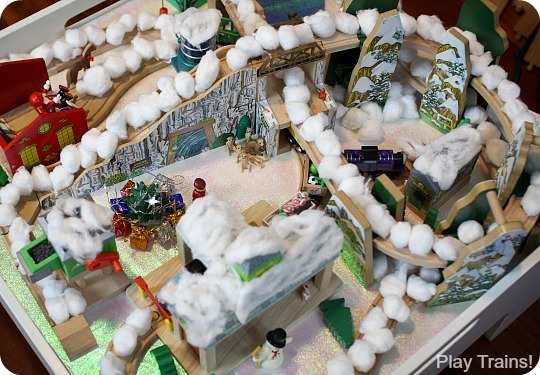 It’s hard to see in photos, especially the sparkles, but it does give a nice natural look, doesn’t need to be taped down, and moves around less than wrapping paper does while you’re building the layout. 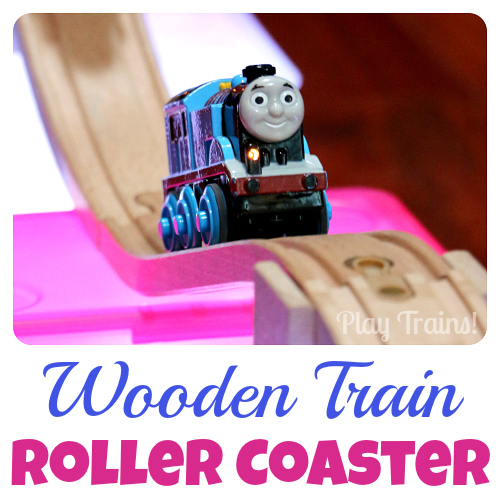 You can see the white felt in action in our Thomas Gets a Snowplow book activity and our wooden train ski jump. 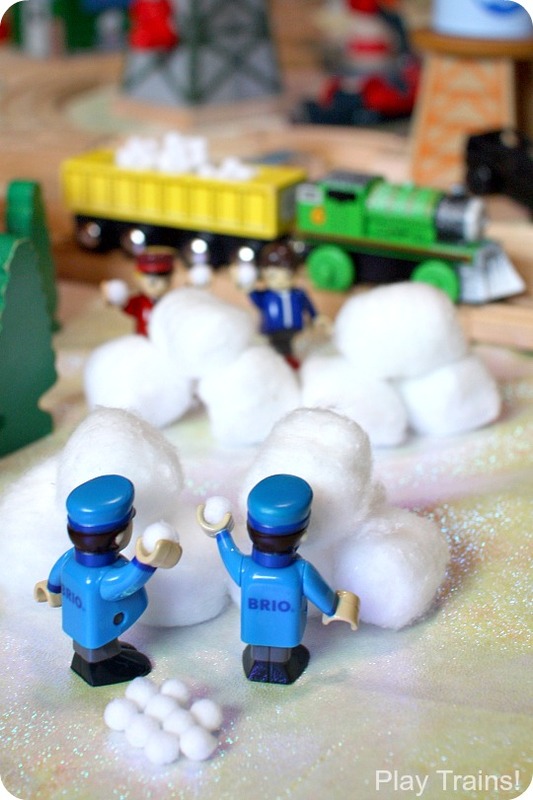 Right around the time we had that one and only good snow two years ago, No Time for Flashcards had this great Winter Train Table Sensory Play idea: cotton ball snow. So of course I went out and got two bags of cotton balls. In the original post, the kids used their snow as freight, among other things, but we decided we wanted to recreate our experience of plowing the real snow outside. 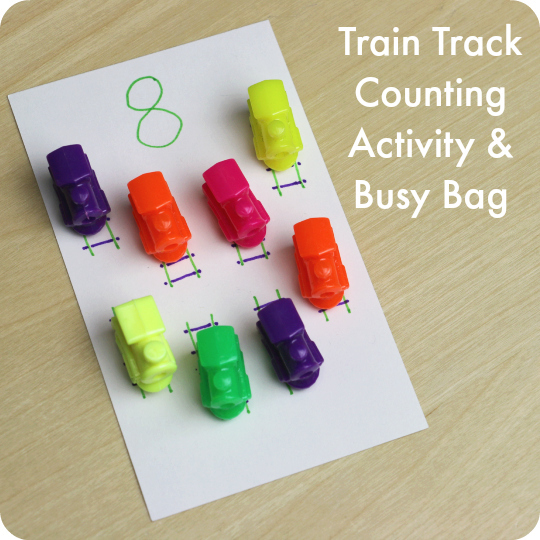 This involved lining up cotton balls on the tracks as fast as I could before the Little Engineer drove Thomas along behind me, sending the snow flying over the edges. This is a huge amount of fun, as long as someone is willing to keep resetting the snow! We have a Winter Wonderland Thomas (from the Adventures of Thomas set) with a snow plow, so he got to do most of the plowing. I kept the cotton balls available for the rest of that year. 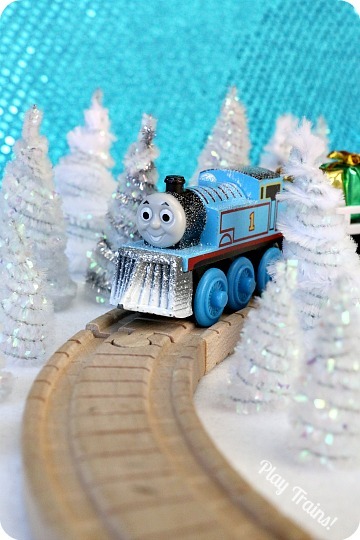 Any time the Little Engineer came across them, he would dump them out here and there around the current layout and make it snow on the Island of Sodor, then ask me to put the snow on the tracks. 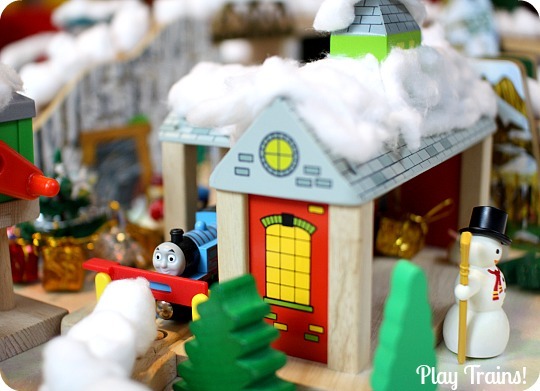 When December rolled around, I made a the more intentional White Christmas layout I mentioned above on his tiny train table and covered everything with snow while he slept. 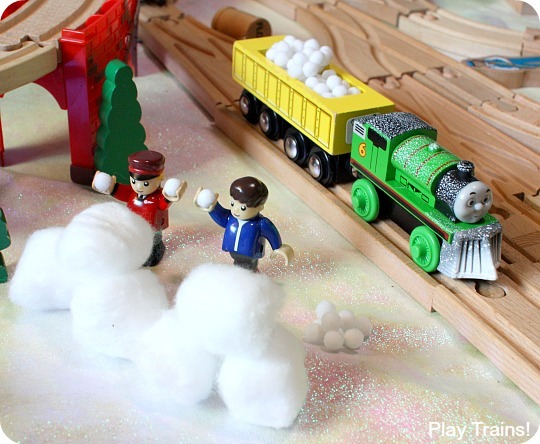 We also used cotton ball snow for the aftermath of the big snowstorm in our Valentine’s Day in Vicarstown layout. My Christmas present from the Little Engineer two years ago was a Winter Wonderland Percy my husband ordered off of eBay, adding more plowing fun to our collection. I really enjoy singing, “Toooooby, oh Tooooooby, what would become of yooooouuu…” (from the song “Toby” found on Thomas’ Songs & Roundhouse Rhythms) every time we made “Poor Toby.” I believe the lyrics to that song are where the Little Engineer got the phrase “poor Toby”, misremembering or adapting “dear Toby” to his new game. As I remember, “Poor Salty” was another favorite game at the time. 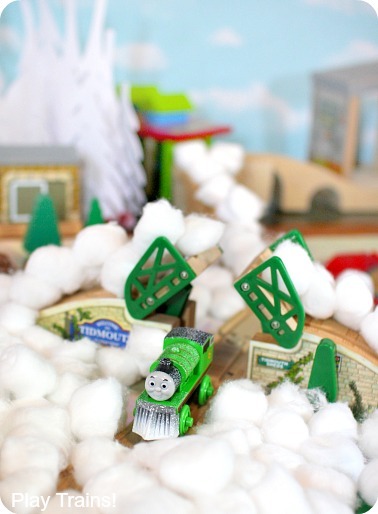 And then when we got our Insta-snow, “Poor Thomas” was fun, too. One last cotton ball trick I discovered in my quest to make everything snowy was to unroll cotton balls and gently pull them flat to make snow on the tops of buildings. 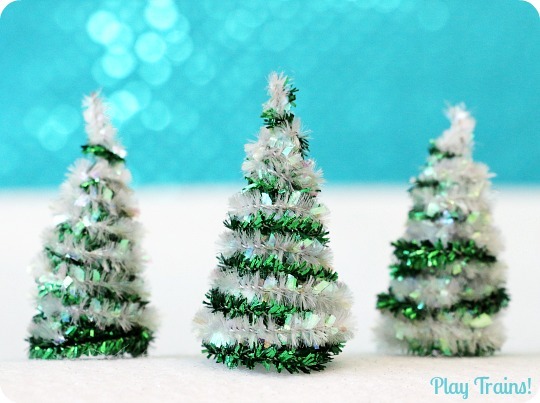 Over the past year, we’ve been busy using pipe cleaners to make all sorts of different trees for our wooden train layouts, like this forest of snowy pipe cleaner Christmas trees that Thomas chuffed through. Here’s another variation from the same post, showing a little green through the snow. Or you could use some of the cotton ball snow from above to crown a deciduous winter tree, as we did for our Winter Pom Pom Trees. That was an exciting discovery! It took a little fiddling to figure out how to slip a snowball into their grips so that it stays, but once I got one in there, it was the perfect size. 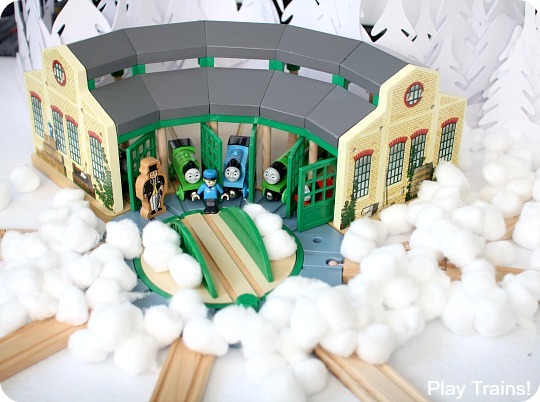 I showed this to the Little Engineer, and told him that the engines could deliver the snowballs to the children (the usual vague children of Sodor, that is) for their annual snowball fight. 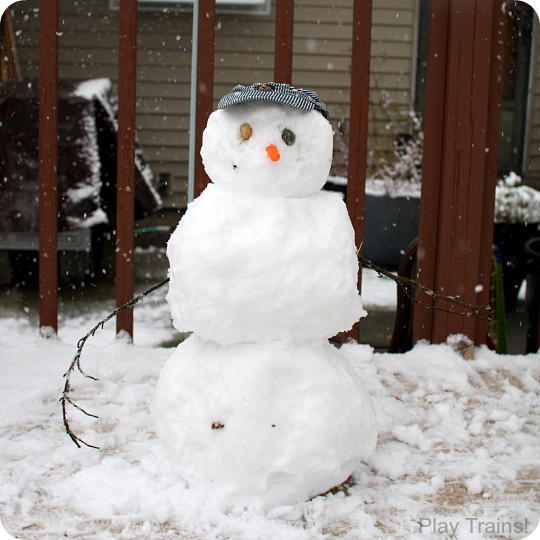 The Little Engineer had a better idea: the children and the engine drivers should have a snowball fight together! 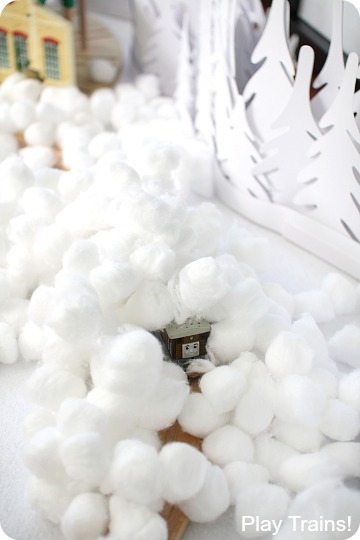 Cotton balls made great snow forts for the drivers and children to hide behind, too.